It looks like the guy who runs the beater either runs a go, a post or a square in (my route terminology may be out of date.) From what I understand, he runs the post if there is no centerfielder and the go if there is one. When does he run the square in? 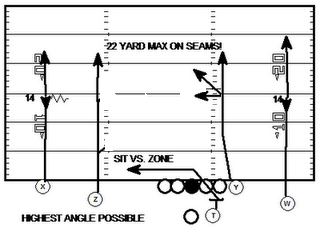 Maybe in a cover 3 situation where there is a 3rd defender in the deep middle? It's explained in the full four verticals article linked to in the post, but he runs a square in against either Cover 2 or Cover 3, but whenever the deep safety or safeties are so deep that a seam or a post would be useless. This is most common with Cover 2, where a post might be ideal but the safeties are deep such that they could squeeze the post. Far better then for the receiver to break on the square-in underneath them. Hopefully that makes sense. An alternative way to read 4 verts. is outside-in to the call side. As long as outside wr has single coverage he should win: go or stop. As soon as Safety or LB expands outside the slot, the wr is doubled. 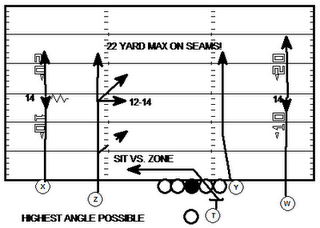 This is very helpful verses quarters coverage - when you frequently end up with 5 defenders from hash to hash. Thanks, Chris. I missed that the first coupla times I looked at that 4 Verticals article. Wow! This is really geeky.